iCanConnect is a program for individuals with both hearing and vision loss. The National Deaf-Blind Equipment Distribution Program (NDBEDP) is a direct result of the 21st Century Communications and Video Accessibility Act of 2010 and is funded by the FCC. The goal is to make sure that every person with combined hearing and vision loss has access to modern distance communication tools and the training necessary to use them. Missouri Assistive Technology (MoAT) is certified by the FCC to administer the project in the state of Missouri. 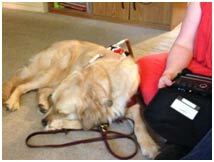 The program covers a variety of equipment based on the individual participant’s distance communication needs. Individuals apply for technology such as an iPhone or iPad or computer with magnification software or a screen-reader. Other equipment may include a neckloop, Braille display, or large-print keyboard. Click on the links to help you decide if you or someone you know might be interested in applying to participate in Missouri’s iCanConnect Program. Contact Brenda with questions about the program, bwhitlock@mo-at.org or 816-655-6700.